The FLARE Index to Treaties which was launched in March 2009 on the Institute of Advanced Legal Studies web server, was conceived to fill a gap in the range of information finding tools available on the internet for the international lawyer. It is a fully searchable database indexing and listing over 1,500 of the most significant multilateral treaties concluded from 1856 onwards. This article describes the background to the development, the various ways in which the service can be used and technical issues in its construction and use. Why was the FLARE Treaty Index developed? Two of the most useful indexes to treaties have existed in print form for many years: Multilateral Treaties: index and current status, compiled and annotated within the University of Nottingham Treaty Centre by M.J. Bowman and D.J. Harris (London: Butterworths, 1984, tenth supplement, 1994) – hereafter referred to as Bowman & Harris – and the World Treaty Index, compiled by Peter H. Rohn (Santa Barbara, California, 1984) – hereafter referred to as Rohn. Bowman & Harris includes details of about 1,000 treaties concluded between 1856 and 1994. Apart from the very useful information on where the text of the treaty has been published in print form, Bowman & Harris attempted to provide information on the current status of each treaty, a task which cost much research time and effort. This additional information includes a listing of the names of the parties to the treaty, the signatories (with dates of signature), denunciations (with dates) and amendments. Rohn, on the other hand, restricted its task to acting as a bibliographic tracing index, but covered both bi-lateral and multilateral treaties between 1900 and 1980, and so contains over 44,000 entries. Reviewing the internet for indexes to treaties it was clear that while much energy and time had been expended on sites with classified, hierarchical lists of treaties and links to the text of them on the internet, there was no simple to use, searchable index to this type of frequently sought material. The Foreign Law Research (FLARE) Group includes representatives of libraries in the United Kingdom having major foreign and international law collections. It includes, in alphabetical order, the British Library, Cambridge University (Squire Law Library), the Institute of Advanced Legal Studies (IALS), University of London, Oxford University (Bodleian Law Library) and the School of Oriental and African Studies, University of London and is chaired by IALS. In addition, a seconded member of the Group is Dr Peter Clinch, of Cardiff University, who created the Foreign Law Guide (FLAG) database inventory of the foreign, comparative and international law collections held by over 60 UK universities and the national libraries, located on the Institute of Advanced Legal Studies website and originally developed at IALS through the UK national Research Support Libraries Programme (RSLP) (see feature about FLAG on LLRX). Between them, the members of FLARE therefore had previous experience of developing successful web indexes to legal materials. Members gave whole-hearted support to the concept of developing a web database to multilateral treaties, based on the bibliographical material contained in Bowman & Harris, supplemented with information from more recent sources. Given the resources available for the project, the database was restricted to acting as a finding tool, and a decision was made not to include details on the status of each treaty as found in Bowman & Harris. Also, it was recognised that to create an index to all treaties (bilateral treaties included) would have been far too onerous, so the scope of the database was restricted to significant multilaterals only. Funding for the project was made available through a successful bid to the University of London Vice Chancellor’s Development Fund and support of the School of Advanced Study, University of London. What details are given about each treaty? a link to details of any developments relating to a Council of Europe treaty or convention posted on its official web site. Information on amendments and protocols has been included either as additions to the entry for the main treaty, where internet versions incorporate this information with the main treaty or, as additional entries in the database, where internet versions keep the text of the amendments and protocols separate from the main treaty. How is the Index searched? the place where the treaty was concluded. We hope to update the Index annually and undertake link checks and maintenance regularly during the year. 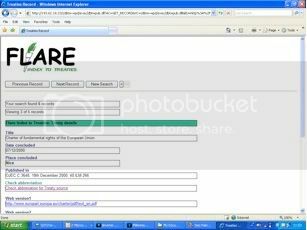 As at the launch in March 2009 the database was correct to mid-Autumn 2008 with link checks to March 2009. 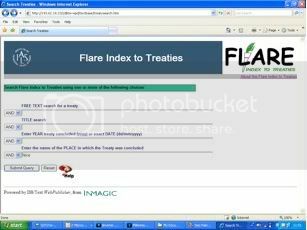 The Flare Index to Treaties has been created and made available freely on the web using Inmagic’s DB/Text and Webpublisher Pro database software (currently version 11). In the UK, both applications are marketed by Soutron limited with options to purchase annual software update releases and additional telephone support. 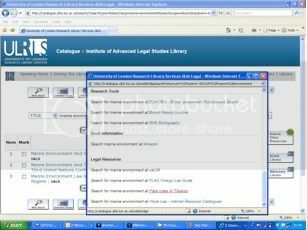 DB/Text runs on the Institute of Advanced Legal Studies’ Windows 2003 web server and is networked to staff PCs to provide database design and creation facilities. 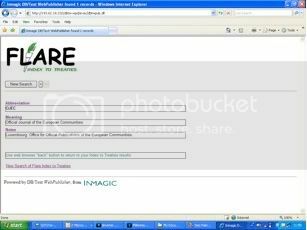 Webpublisher Pro is installed on the same server to publish a number of IALS created web service databases, now including the Index to Treaties, to the web via a virtual directory in conjunction with Microsoft Internet Information Server (IIS). Following the model established with the successful FLAG Foreign Law Guide project, an initial working database for the Index to Treaties was designed in Microsoft Access to provide a ready and easily exchangeable means of collating the treaty data. Periodic copies of the data were exported from Access and loaded into a DB/text database with matching field structure on the IALS web server. 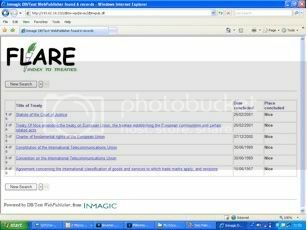 The Index to Treaties web interface comprises: a search screen, results table and individual record display. The search screen is a simple form designed to help locate relevant treaty details from as much or as little initial information as a user has available. You can type any word, combination of words or phrase in a free text search box which covers key fields in the database such as official title, popular title, other title and keywords. There are also separate search field options to search by words known to be in the treaty title, or the year or date when the treaty was concluded or the place where the treaty was concluded. Once you have prepared a query, you just click on the Submit Query button or press the Return/Enter key to perform that search. A Reset button clears the form to start a fresh query. In the example below, the only information known is that Nice is the place where the treaty was concluded. A Help option offered by the question mark button at the foot of the search form offers guidance on constructing more complex queries. Boolean search functionality, truncation and proximity searching is available within individual fields to expand or narrow the focus of a particular search. Within a field the Boolean logic operators AND, OR and NOT are represented by the characters &, /, ! to connect search terms. Additionally, Boolean search functionality is provided between fields in the database structure. Dropdown menus ahead of each field enable you to select the connectors AND, OR or NOT and combine searches involving several fields at the same time. The results of a successful search are presented in a table displaying the title of the treaty, date concluded, and place concluded, batched in groups of ten entries, with an indication of the number of records the search has retrieved. The treaties are listed by title in date order with the most recent dates first. The occurrence of the search term(s) used is highlighted in bold text in each of the records presented. Buttons to aid navigation between the next and previous set of records are displayed at the top and bottom of the table. Similarly a new search button features at the top and bottom of the table to return to the initial blank search form. Use of the browser Back button allows modification of an existing search. The Results Table offers a link from the treaty title to the full record entry for each treaty. A full record includes: popular, official and alternative treaty titles, details of the date concluded, place concluded, published sources and where the treaty is available on the Internet, the records have embedded links to reliable and stable web versions of the treaty, and where appropriate links to value added information on the treaty offered by the ASIL’s EISIL service. The navigation buttons above and below the treaty record again enable you to move to the next or previous record in the set or initiate a completely new search. Search results can be printed using standard web browser printing options from either the results display or full treaty record. The treaty records include a facility to check the meaning of abbreviations cited for treaty sources, through a link to a secondary database, containing entries expanding the meaning of abbreviations referenced in the published sources field. Webpublisher Pro software includes URL checking facilities to help us trace broken web links in each of the URL format fields. 123 Log Analyzer software is employed on the IALS web server log files to monitor usage on a monthly and annual basis. Earlier responses to the index have been very encouraging. The index aims to provide a new research tool to complement existing sources, aiding scholars and students, lawyers and librarians in researching international law of treaties – whether they are new or experienced in the field. We anticipate that the Flare Index to Treaties will assist with checking references, writing papers and preparing teaching materials. We welcome suggestions on potential additional content and scope for service development. In recent years many of our library system suppliers have developed products to provide context-sensitive links from the traditional library web catalogue to other relevant web-based resources, which can now include the Flare Index to Treaties. Products, such as Innovative Interfaces Inc.’s WebBridge and Pathfinder Pro, enable a catalogue search to be taken forward to a range of other relevant resources, so researchers can trace library-held print materials or electronic resource subscription services and then go on to find other relevant resources, in this case through links with the Flare Index to Treaties, raising awareness of the full range of available materials. 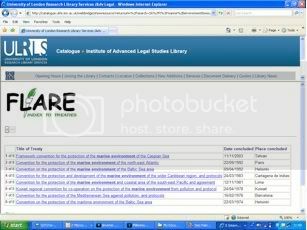 In this example a title search for “marine environment” on the IALS Library catalogue is taken forward to a selection of other law resources on the web, presented through the “search other resources” button and WebBridge resource selection panel. Clicking on the Flare Index to Treaties link option performs the search on the Index and open the results table without leaving the original library catalogue screen. The new generation of library vertical search and discovery platforms like Primo from Ex Libris and Encore from Innovative will work with this content to offer up front results dynamically from Pathfinder Pro type searches. Who do I contact with comments, queries and reactions to the Index?